Summary: Even after decades of study, much remains unknown about the juvenile years of marine turtle life history. 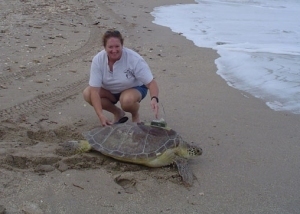 In Florida there appears to be a lack of individuals above 70 cm, however adult green turtles are found in the lower Florida Keys. Using satellite telemetry to follow the largest juvenile green turtles as they leave nearshore developmental habitats should provide valuable insight about migration times, routes and destinations that will allow managers to make important conservation and management decisions for this endangered species. Satellite transmitters will be attached to the carapaces of juvenile green turtles of approximately 70 cm or larger inhabiting inshore and nearshore developmental habitats of the east central Florida coast. Satellite technology will allow us learn more about when they leave local waters, their migratory routes and destinations.